A warm and inviting aura welcomes you as you open the door to the Colonial Suite, situated on ground floor level, providing easy access to guests of any age. 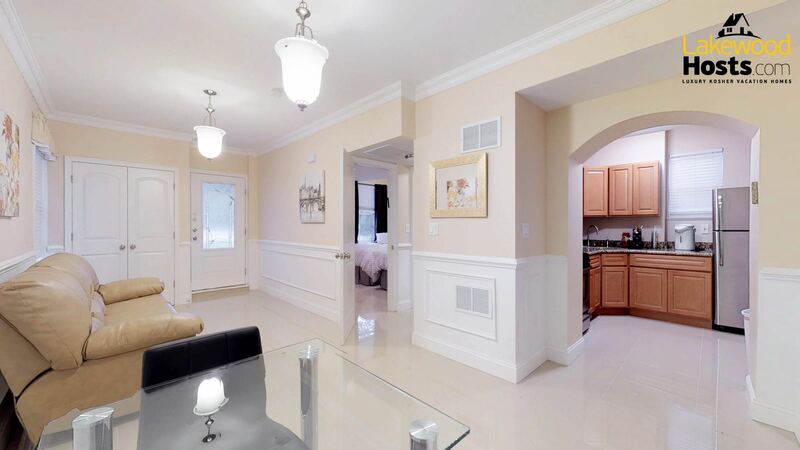 Located in the popular Chestnut Ridge area, you will love the fact that stores, restaurants, shuls, and Simcha halls are but a short drive away. As you enter, your eyes will take in the beautiful pale peach and honey-toned paint color with white wainscoting. An inviting leather couch with two built in recliners and a dinette table that seats two comfortably furnishes the main room, with a spacious entry closet hiding discreetly in the background. Beautifully chosen artwork graces the walls and it is apparent that great care was taken when choosing every item in this suite. The kitchen has plenty of cabinets, two sinks, and a unique granite “pebble” wraparound counter. A stainless steel gas cooktop and oven, along with a large fridge, make it simple to prepare food from scratch or warm up take-out. 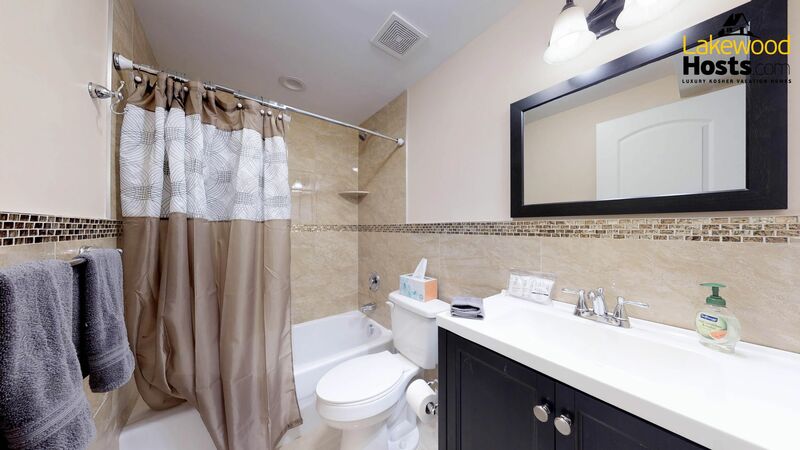 The bathroom is decorated with sleek accent tiles, dark wood vanity, and beautiful lighting, guaranteeing total relaxation with the rain-shower head in the tub area. A stackable washer/dryer is conveniently located directly outside the bathroom area. The bedroom accommodates up to two guests with its spacious queen-size beds. High ceilings in the bedroom provide plenty of room for your sweet dreams at night. The Colonial Suite is the perfect getaway spot for a couple looking to enjoy an extended weekend or a Yom Tov in a serene and soothing environment. They r wonderful to deal with. Ty. Pasé con mis hijos 10 días inolvidables en New Jersey, la atención espectacular en ambos sentidos, quien me alquiló la casa y el dueño de la misma, Casa muy cómoda y limpia, de volver ... SEGURO!! The apartment was spotless clean and fresh. Thank you so much for providing us with a Super Clean walk in nice apt. It was 10 min walk away from new Satmar Shul and the neighborhood is quiet and serene. Classy apt with everything that we needed. Shkoiach! Thank you to Shaya and the Lakewood Hosts staff for arranging us such a nice apartment on such short notice. We called Tuesday Morning and wanted to stay for 2 nights. They found us this place for Tues & Wed night and we checked out Thursday morning . Its new and fresh and CLEAN. Nice linen, furniture, washer dryer, nice bathroom ,kosher kitchen, near a Yeshiva, Shul, Mikvah, Close to a park, Only Hemishe families on the block. What a great concept. Thank you!!! Very Nice Chic Apartment neat the Chasana Halls in Lakewood. I was shocked to get such a nice place for about the same price as a Mid Price Hotel. Nice Bedroom , Good Beds , Good Quality everything in the apartment. Bathroom and Kitchen also very nice. Highly recommended .